The Colorado Watershed Assembly (CWA) has an immediate need for a qualified, independent contractor to serve as the South Platte and Metro Basin Roundtables Education Coordinator. CWA is working with the South Platte Basin and Metro Roundtables to engage and support an individual to serve as Education Coordinator to oversee internal roundtable and external stakeholder educational activities as the Roundtables proceed to implement their Education Action Plan (EAP), South Platte Basin Implementation Plan (BIP) and Colorado’s Water Plan (CWP) using the Roundtables Strategic Communication Plan (SCP). The position will work with the Colorado Water Conservation Board (CWCB) public engagement specialist to carry out the responsibilities of the Public Education Participation and Outreach (PEPO) workgroup. Work will start immediately and continue through December, 2018. For a full position description and how to apply go to RFS Education Coordinator. The Colorado State Forest Service is requesting proposals from qualified Contractors for facilitation and coordination services of the South Platte River Urban Waters Partnership (SPRUWP). Awarded for one year, this contract may be extended up to five years. Services of the contractor will assist local partners identify federal tools and resources in support of local projects, goals, and objectives. Also, to encourage collaboration, minimize competition, and improve communication among partners. The contractor will serve as a catalyst to successfully complete on-the-ground projects and build relationships and capacity that support continued success for decades to come. Due date for this Documented Quote is Monday, August 14th, 2017 @ 5:00 PM MST. Responses must be sent electronically to: fady.elsegeiny@colostate.edu. Please enter the document number and title, D810085 South Platte River Urban Waters Partnership Ambassador, in the subject line of your email, this applies to all email correspondence in regards to this solicitation. The City of Steamboat Springs has a great opportunity in their Public Works Department as the Distribution and Collection Manager, reporting to their Public Works Director. The qualified individual leads, directs and manages all programs and activities of the Water Distribution and Wastewater Collection Division. Performs a variety of supervisory, administrative, skilled, technical, and maintenance work in the budgeting, planning, construction, operation, repair, maintenance, and replacement of the City water and sewer system. For more information and to apply go to Steamboat Springs Position. Highlands Ranch Metro District is currently seeking an experienced, motivated individual to fill the Park Ranger position in the Parks, Recreation and Open Space department. Successful candidate must be a team player and have a strong desire to provide excellent service to their community. This is a full-time position working 40 hours per week, which does require working a flexible schedule including weekends, holidays and evenings. This position will be assigned to patrol parks, trails and open space, interface with park users and program participants for oversight of rules compliance. This position will receive a limited commission as a Code Enforcement Officer through the Douglas County Sheriff’s Office and wildland fire training through Littleton Fire and Rescue. Click HERE to apply. South Suburban Park and Recreation District has a full-time job opportunity for an Arborist II, Tree Trimmer position titled Lead Maintenance Specialist – Forestry. Under direct supervision of the Large Tree Care Supervisor, assist in the scheduling, coordinating, directing, assigning and evaluating of annual, monthly and day to day work plans and personnel associated with the District's large tree care program, which includes, but is not limited to: tree pruning, tree removal, stump grinding and includes tree support systems as well as participating in forestry-related special events. Assist Supervisor and other Forestry, Horticulture and Graphical Information System team members with mapping District assets, personnel training, snow removal, storm damage response, mosquito control, special projects and maintaining a safe work environment. Click HERE to apply. Ken-Caryl Ranch Masters Association is seeking a Seasonal General Maintenance Technician in their Open Space Department. Ideal candidate should have working knowledge of mowing operations, mowing equipment and maintenance and general open space and facilities maintenance. Seasonal Maintenance Technicians will be subject to hot and cold working conditions outdoors, physically strenuous work, and working with power equipment. Click HERE to apply. The Mountain Park Environmental Center is seeking a Program Director. The Program Director plays an important role in the successful and effective implementation of the mission of the Mountain Park Environmental Center. MPEC’s mission is to provide environmental education in order to create a citizenry that understands, respects, enjoys and cares for themselves, their families, community and the natural world. The Program Director is responsible for managing and directing all aspects of school, camp and adult programs. This position is a very visible face of the organization and will represent MPEC to the community in many capacities. For more information and to apply visit HERE. 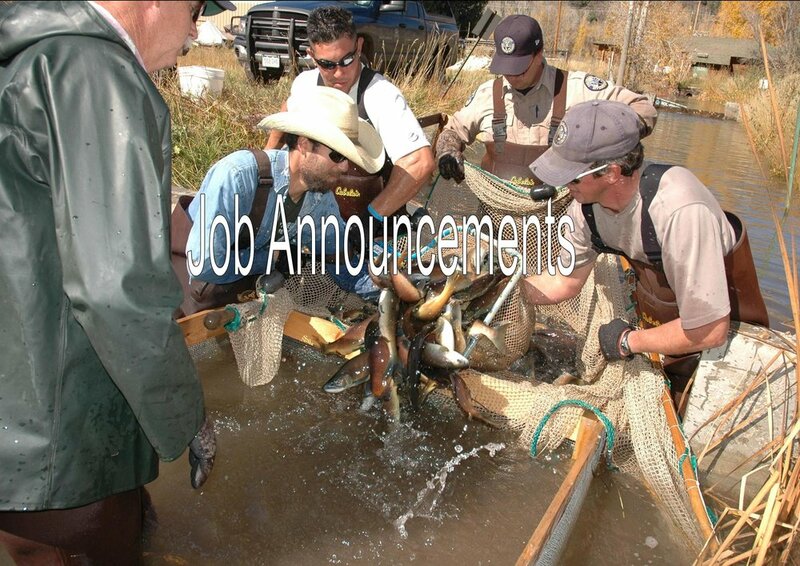 At Colorado Parks and Wildlife discover your dream job. Learn about Career Opportunities with Colorado Parks & Wildlife... Biologist, District Wildlife Manager, Fish Hatchery Technician, Park Range, Property Technician, Wildlife Researcher, Youth Conservation Corp. To apply visit their website.